Ashley Roberts assisted in the development of BHA’s Strategic Sustainability Plan. Ashley Roberts was enlisted by Boston Housing Authority directors to incorporate the Virtuous Cycle of Strategic Energy Management strategies in order to further enhance organizational support for energy management. While assisting in the development of BHA’s Strategic Sustainability Plan, Roberts analyzed utility data to make the case for the need of further detailed utility monitoring and a dedicated staff. To support this initiative, Roberts and team identified specific software with capabilities to provide accessible, easy to interpret usage data, which could also facilitate development of a resident dashboard to communicate usage details for individual rental units. In addition, a survey was launched at the 2013 Resident Summit in order to gain insight on residents’ attitudes about energy conservation. A final aspect of the project identified leaders in climate research to assist with the development of an actionable climate preparedness plan for all BHA properties. Results from this survey, alongside environmental psychology techniques, will be used to design an energy conservation resident engagement program. Alternative financing mechanisms were investigated, and a total of over $3 million in incentives and rebates were identified through the 179D tax rebate along with on-peak demand revenue and community partnerships. 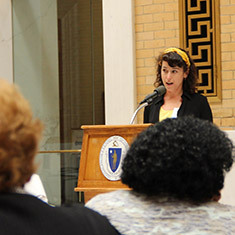 Ashley Roberts, a student at Appalachian State University, was hired as the 2013 EDF Climate Corps fellow at Boston Housing Authority.